No matter how lovable your dog may be to you, some boundaries should definitely be set for your pet in order to keep it disciplined. No one would want their pooch to wreck a havoc roaming freely around the house, especially right before the arrival of important guests. Would you? It can freak them out, no? Well, if you can relate to similar situation, then it’s the right time to arrange a comfortable yet secure place for your beloved. 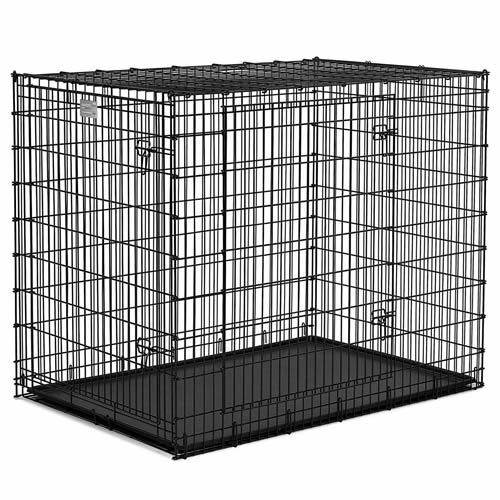 This extra large heavy duty metal 54 inch dog crate is an ideal solution for large dog breeds. It is suitable for big dogs providing them ample space to feel easy, while simultaneously offering you the freedom of doing some important work without worrying about your pet getting hurt or any such related concern. Just like you do, your pooch also needs some private space. Locking them in a cage is basically a part of training. It helps the pet to understand its limitations. Also, a crate is essential for those who love to travel and want to take their pets along. It allows the owner to lock their pet in the sea-shore for a sunbathe or in lawn for breathing in fresh air, without worrying about them running away or destroying things. 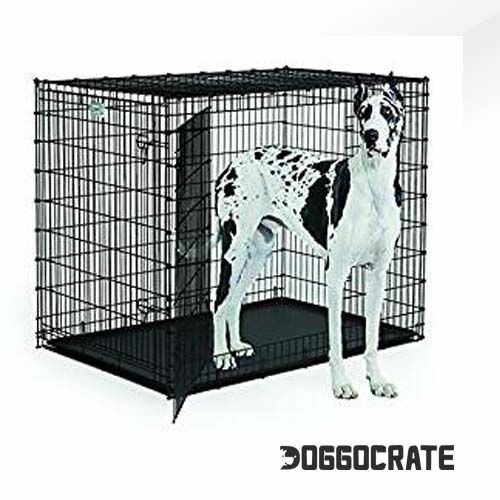 With dimensions of 54 x 37 x 45 inches and weight of 80.2 pounds, this double door metal dog crate is perfect for larger animals that weigh around 90 pounds or even more, including Great Danes, St. Bernard’s, Mastiffs, etc. It has a drop-pin construction with four drop pins that ensure a strong and secure assembly. However, as this cage is manufactured for big animals, so at least two people will be required to assemble its extra-large structure. Although, things can get really tough while trying to assemble it single-handedly, but still the cage is easy to set up, if there is another person to assist. This crate is quite durable due to the high-quality metal used for its manufacture. It boasts two heavy-duty slide bolt latches on each door, which makes it totally safe and secure for your pet to reside in. Moreover, it has four rubber roller feet to provide protection on hard floors. In addition to this, there is a removable leak-proof pan included within the package, which is easy to clean and adjust. All in all, this extra-large crate ensures that your loyal friend is secure and comfortable inside, in a hygienic environment. Another great thing about this dog cage is that, it has a protective E-coat finish that keeps it safe from rusting, hence making it a long-lasting investment. Below is the detailed review about the features of this crate. Keep reading! As the name suggests, the extra large dog breed metal dog crate is a large cage with an ample space. Its wide structure enables your dog to lie down, stand, sit, sleep, eat and just feel overall comfortable in its own personal place. This crate is made of heavy metal and is thus very durable. Moreover, the E-coat finish keeps rusting away making it an investment not to miss since it can last a long time and provide your pet with utmost comfort. What else do you need? 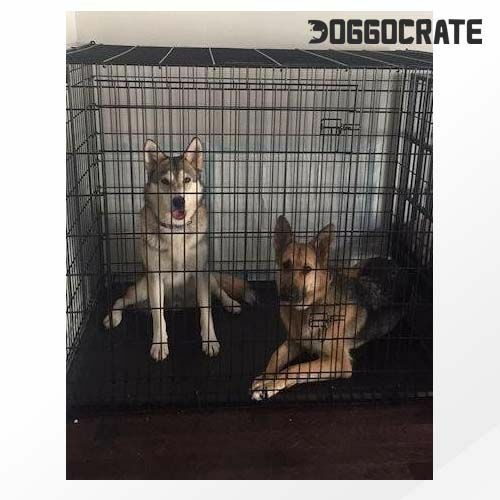 This crate comes with slide locks on each of its two doors, making it safe and secure for your pooch to stay in. 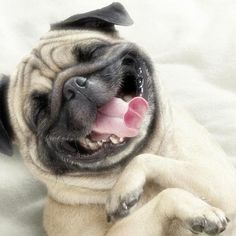 Only you shall have the authority to lift the lock up, when you wish to have some fun time with your canine buddy. The dog cage is designed in such a way that it doesn’t need any professional help to set up. Just two individuals are needed to work together for assembling the metal dog crate without any extra tools or hard efforts. Since it is quick and easy to set up, the crate can be used indoors as well as outdoors. Besides a bunch of pros, the only drawback of this product is space consumption. You should definitely consider this crate for your pet in order to provide a comfortable and safe space of its own. 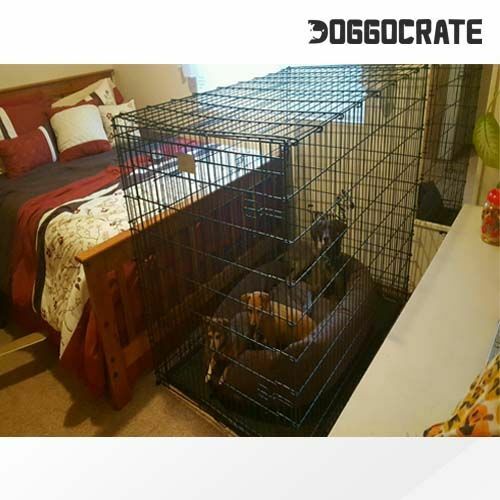 This can be made possible simply by bringing home the Extra large dog breed metal crate home. It is a one-time investment since the crate is not just secure, but it is long-lasting as well. This product is designed to comfort you and your beloved friend at the same time. You can get this structure set up in a corner of your house where you can easily monitor and interact with your pet through its see-through metal walls. From durability to reliability and security to the assembly, everything about this product is worth your investment. Besides attention, your loyal friend needs some space, security, hygiene and comfort. Fortunately, this crate possesses all these features and that to in a reasonable price. Why don’t you buy and try yourself? 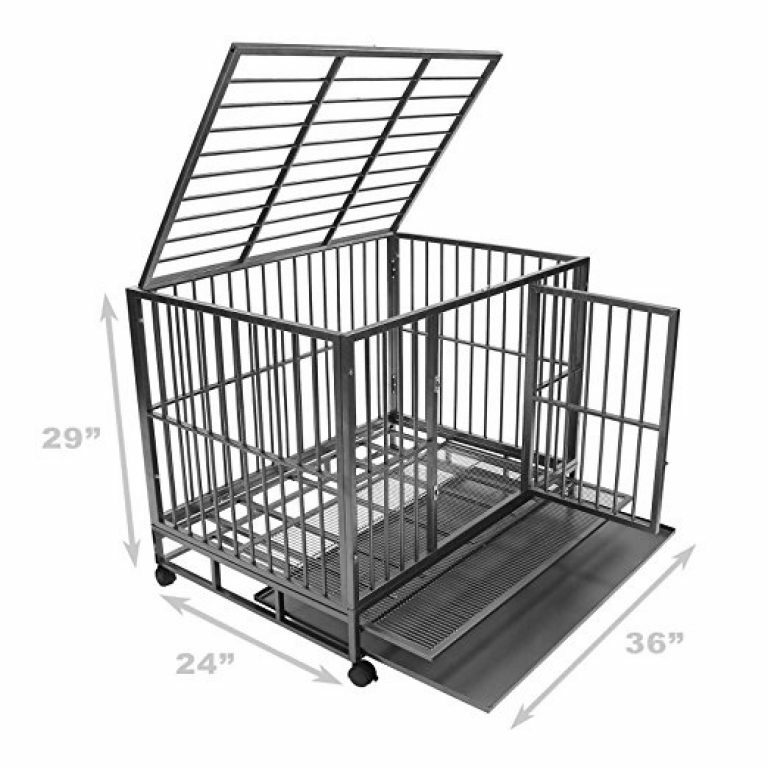 A very sturdy built metal dog crate with double door best for large dogs weighing over 90 lb. Its removable pan is leak proof and easy to clean with rust proof E-coat finish.